This week marked a hundred years since the founding of Azerbaijan’s modern army during the short-lived Azeri republic that emerged in 1918. To commemorate the anniversary, President Ilham Aliyev was in Baku’s scenic Azadliq Square on June 26 where a lavish spectacle took place. It was the perfect occasion to show off the different weapons purchased by his government these past few years. For his speech during the June 26 parade Aliyev hit all the proper notes–the wonderful progress Azerbaijan made since gaining full independence in 1993; the country’s rightful claim to Nagorno-Karabakh; and how strong the armed forces had become under his leadership. 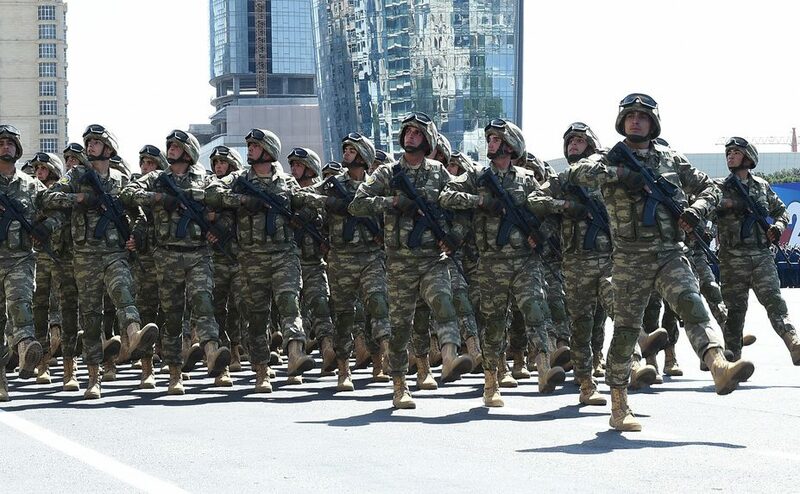 So how strong is Azerbaijan’s military now? Pretty strong. The June 26 parade involved a reported 4,000 soldiers from every branch of the armed forces. The infantry squares that stomped past the Presidential Palace carried different types of small arms. Apparently, whatever the new doctrine of the army is, there aren’t standard issue small arms anymore. One unit in particular had AR-pattern rifles designed to use AK-47 magazines. These were the same ones seen at a base Aliyev inspected just weeks ago. Azerbaijan’s elite units, on the other hand, carry modded AK-74’s while other specialist troops have the Israeli Tavor 21 and X95 bullpups chambered for NATO ammunition. It’s a dazzling arsenal that reflects how farsighted (or out of control) Baku’s military splurge is. Foreign delegates were at the parade too and an infantry unit from Turkey marched with their impressive MPT-76 rifles. If the martial pageantry on June 26 proved anything, it was Azerbaijan’s fondness for Israel’s stuff. It’s actually difficult to establish whether Tel Aviv or Moscow is the more devoted arms merchant for the Aliyev regime’s needs. Dozens of Israeli SandCat tactical 4×4’s were in the parade, with hundreds probably used throughout the armed forces. The SandCat is built on a Ford F chassis and offered by its manufacturer Plasan in multiple variants. Azerbaijan’s army have the “basic” SandCat carrying a remote controlled turret that combines an NSV machine gun with a tandem missile launcher; then there’s the Stormer EX troop carrier with enough seating for nine infantrymen; then SandCats armed with Spike-ER top attack missiles on a pivoting mount; and SandCats equipped with the 120mm Spear mobile mortar. The army’s fleet of armored 4×4’s used to be dominated by Otokar Cobra’s but these were no longer as plentiful, though a few appeared with Shershen anti-tank missiles on their roof. Some of the South African Marauder and Mbombe MRAPs in the parade did have a unique main armament, the 14.5 KPVT on a remote controlled turret. 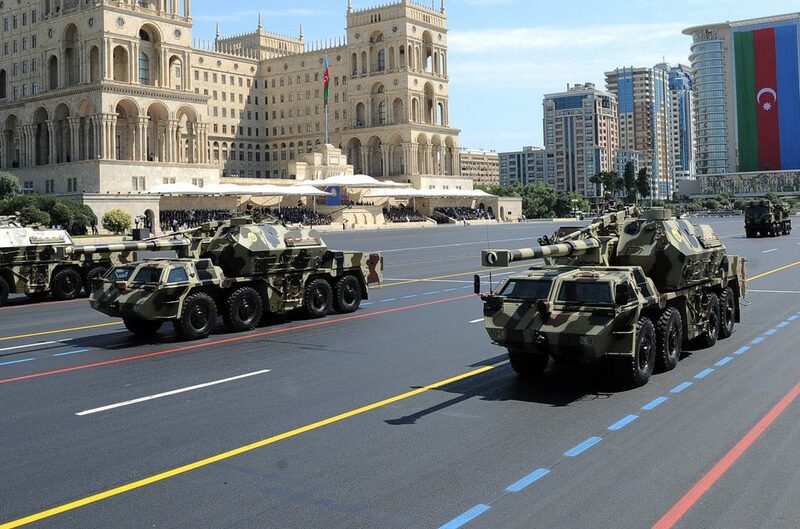 The different kinds of air defense vehicles driven through Baku were simply jaw-dropping. Aside from paying a fortune to get the Russian S-300PMU2 Favorit, it looks like Baku spent an equal amount for the SAMs pictured above. These turned out to be Israeli-made BARAK 8 long-range SAMs and are meant to serve as an additional line of defense against Armenia’s Iskander ballistic missiles. The BARAK 8 is manufactured by Israeli Aerospace Industries (IAI) and how many were delivered to Baku is unknown. These might have arrived by plane in canisters and then installed on 8×8 MAZ trucks imported from Belarus. Other mobile air defenses seen in the parade were all Russian like the short-range 9K33 Osa and the medium-range S-125 Pechora and the Buk. Another offensive capability Azerbaijan spent serious money on are various UAVs. 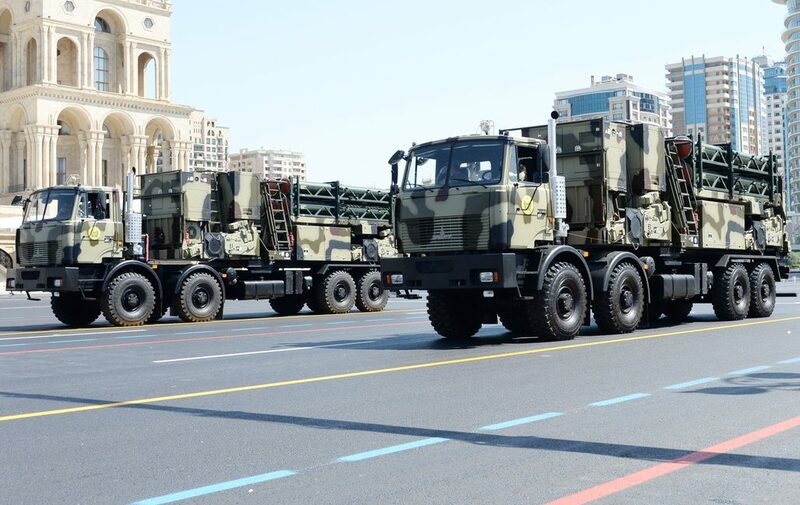 Judging by what was shown at the parade, Azerbaijan’s UAV fleet could now rival Iran’s homegrown drones in size and variety. The difference, of course, is Azerbaijan sought Israel’s expertise to develop its aerial surveillance tools–none of the airframes that appeared in public on June 26 were locally made or designed for carrying bombs or missiles. The fixed wing UAV pictured above is the Hermes 450 made by IAI. Its primary use is for flying in circles above designated areas to feed commanders real-time intelligence. A Hermes 450 can remain airborne for 16 hours but the Heron TP that was pulled by another truck in the parade is able to fly missions for almost two days straight. The Hermes 900 is the third fixed wing UAV from IAI purchased by Azerbaijan’s and one of the best long endurance drones in the world. Since its maiden flight in 2009 the Hermes 900 has been snapped up by several Latin American countries. It made its combat debut in 2014 when the IDF used it during operations against Hamas. It’s still hard to prove whether China’s own Wing Loong–now available for export–is just a licensed Hermes 900. 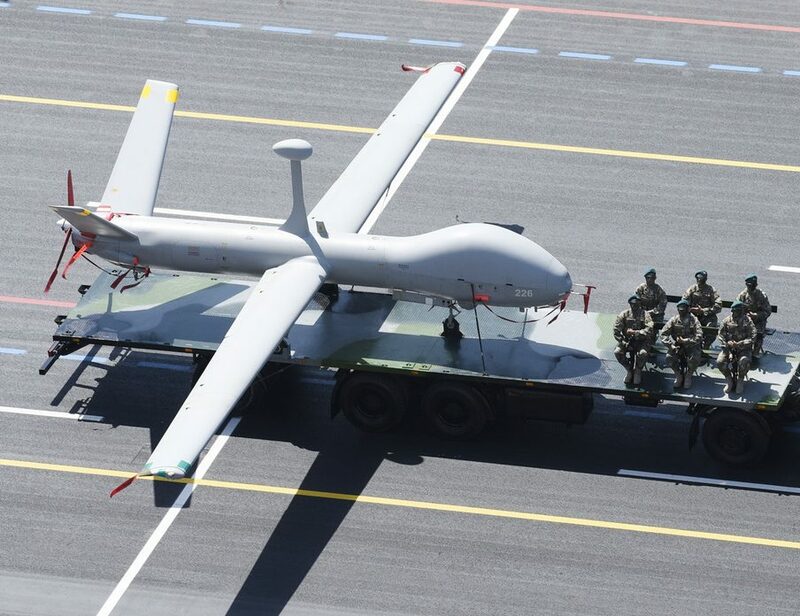 Together with the Heron TP and the Hermes 450, Azerbaijan’s military may now possess a drone network that surpasses what the Russian Federation has and should give Iran pause. The Hermes 900 by itself can watch over any disputed terrain for days on end. Among the advanced weapons shown to the public in Baku on June 26 the most ominous were 6×6 trucks carrying unmarked crates. It turns out these were the launch platforms for the “Harop” loitering munitions that’s part of IAI’s extensive catalog. Azerbaijan reportedly deployed these during a short war with Armenia in 2016. 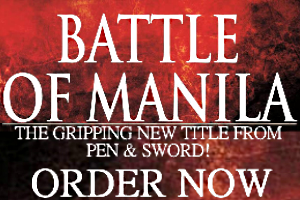 This prompted renewed interest in small “kamikaze drones” and several countries have since promoted their own versions. Aside from the Harops, a few of the Marauder MRAPs in the parade were seen carrying what looked like IAI’s Bird Eye short endurance drones. 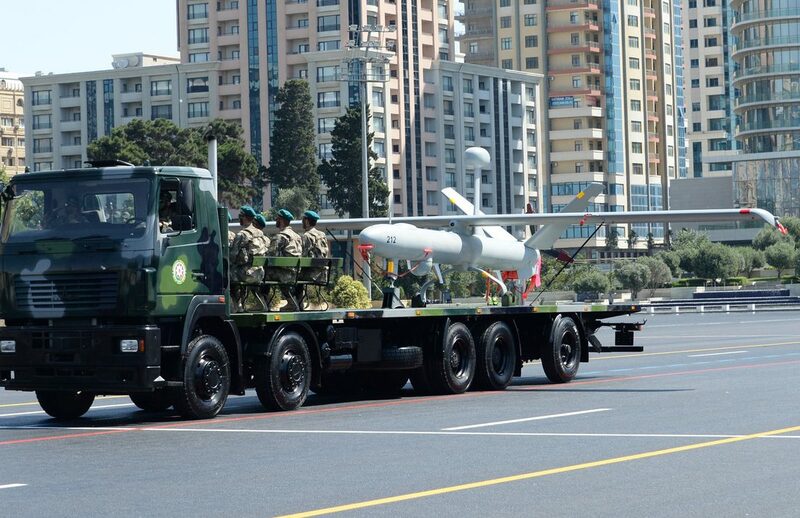 This is ultimate proof that oil-rich Azerbaijan bought almost every type of unmanned system offered by IAI. This is in addition to the Israeli-made guns, armored vehicles, artillery, jamming equipment, and LORA ballistic missiles Baku paid for. 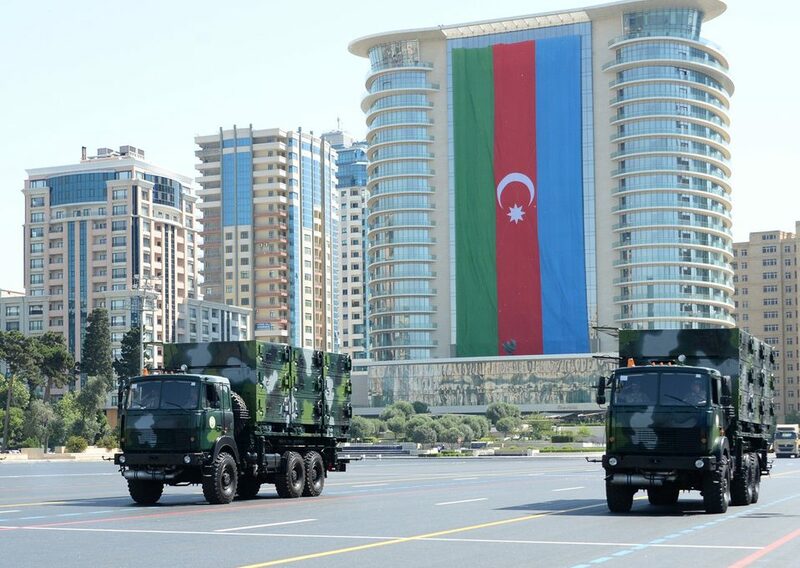 While it’s been established Russia, Israel, Turkey, and Belarus are the top four military suppliers to Azerbaijan, the June 26 parade did feature one of Europe’s best known self-propelled artillery systems. As its name indicates, the Dana M1 CZ is made in the Czech Republic and is recognizable for the 152mm howitzer in an oscillating turret carried by an 8×8 truck. The Dana M1 CZ is the third self-propelled 152mm howitzer deployed by Azerbaijan’s army. The other two are aging 2S3 Akatsiyas and the new 2S19 Msta S–the latter is recognized as one of the best mobile artillery pieces in the world. It’s surprising to learn that, despite constant rumors, Azerbaijan never followed through with ordering the Turkish Firtina self-propelled howitzer that’s based on the South Korean K9. Ankara’s everlasting generosity to Baku didn’t go unnoticed, however. 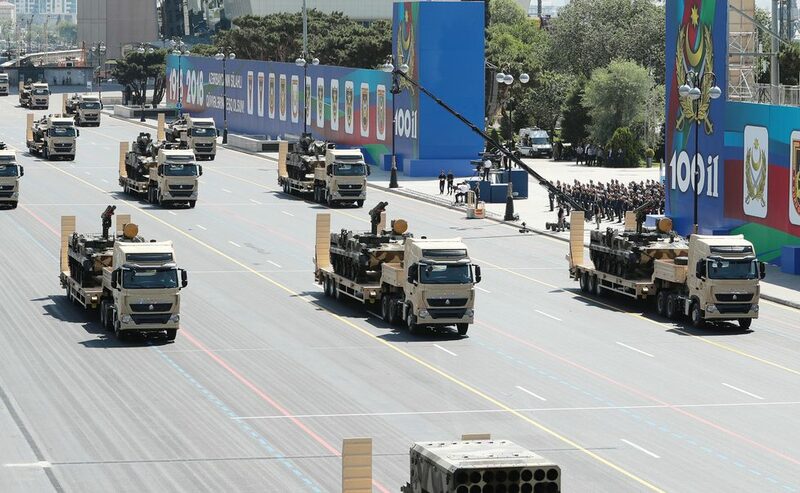 The organizers of the June 26 parade did put a SOM air-launched cruise missile made by Roketsan on a truck. Are the Azerbaijan air force’s MiG-29’s supposed to carry these for deep strikes inside Armenia? The rocket artillery that rolled by in Baku puts either Iran or North Korea to shame. Pictured above are RM-70 122mm launchers from the Czech Republic. Behind them are a trio of Lynx 160mm rockets–the modules were designed in Israel but are mounted on Belarusian Kamaz 6×6 trucks. Another Belarusian rocket artillery system, the dreadful Polonez that was delivered last year, joined the parade. In what amounts to certain overkill, the 300mm “Kasirga” rockets–on 8×8 Kamaz trucks, of course–made in Turkey that’s based on Chinese technology showed up as well. Azerbaijan’s military also have the Soviet vintage BM-21 Grad, the BM-30 Smerch, and the TOS-1A that’s armed with thermobaric rockets. That’s a total of seven medium and long-range mobile rocket launchers in their arsenal whose cumulative firepower–imagine the Smerch, Kasirga, and Polonez used simultaneously–is unmatched by most NATO armies. Azerbaijan’s state-owned military industries can also manufacture launchers for ubiquitous 107mm rockets but these haven’t been seen in years. 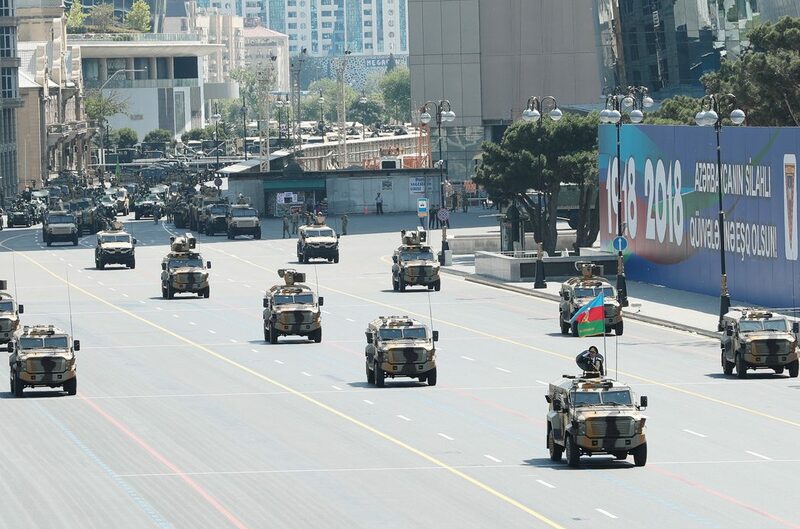 The June 26 parade drove home how Baku and Moscow remain tighter than ever. 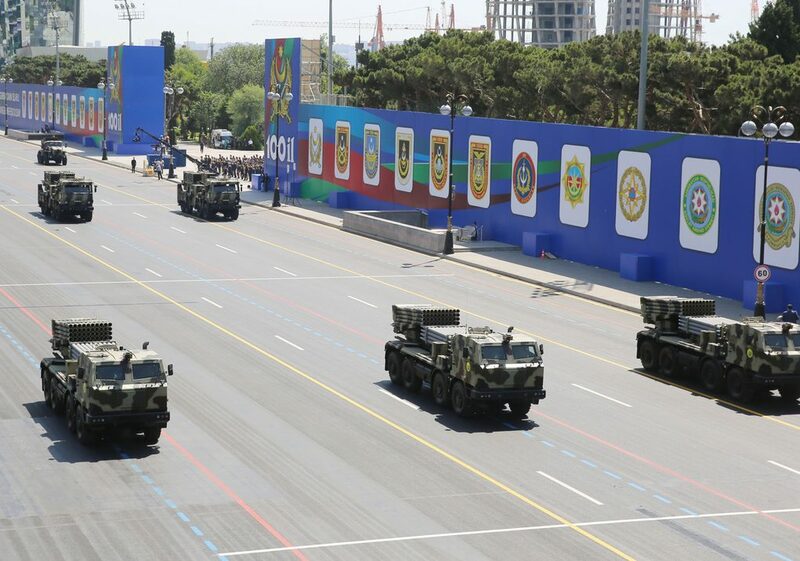 Even if Turkey does its best to act like Azerbaijan’s ultimate benefactor, there were more new Russian weapons at the parade compared to any post-Soviet state. Unlike that other nutty dictatorship across the Caspian, Azerbaijan’s petrodollars puts it in Rosoboronexport’s eternal good graces. Seen in the photo above are Khrizantema mobile anti-tank vehicles that are based on the BMP-3, which Azerbaijan’s army also have. Each Khrizantema is armed with two 150mm missiles that can destroy targets as far as six kilometers away. Behind the Khrizantema’s are another row of trucks pulling 2S31 Vena self-propelled mortars that’s based on the BMP-3. There are a lot of leftover Soviet arms kept by the army until now. These include the T-72 tank, the BMP-2 IFV, the 122mm Gvozdika and 152mm Akatsiya self-propelled howitzers, the massive 2S7 Pion 203mm self-propelled howitzer, S-125 mobile SAMs, and the usual assortment of 122mm and 152mm towed howitzers. No military parade, especially the lavish Sovietesque kind, is complete without a grandiose flyover. 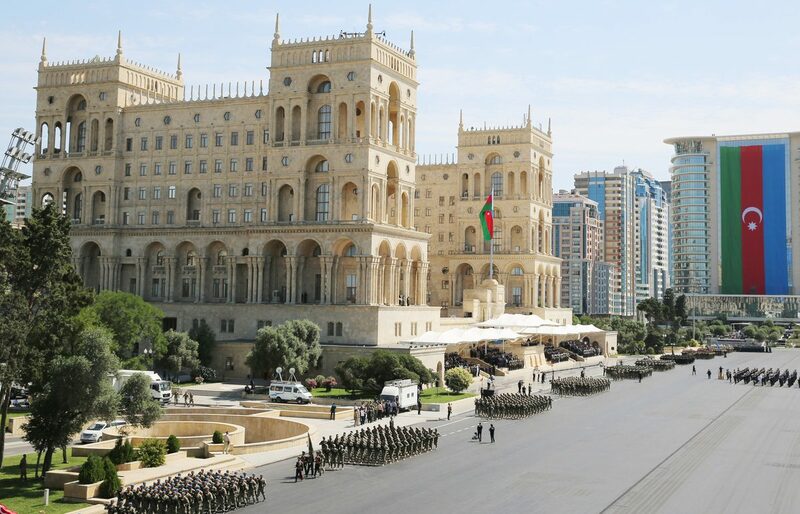 Azerbaijan’s modest air force played an important role towards the end of the June 26 parade. A flight of L-39 trainer jets roared above the capital, tracing the national colors with their contrails. But even more impressive were a menacing formation of Hind gunships. These were the Mi-24 SuperHind Mk. IV and M-35M variants (the latter have non-retractable landing wheels) the air force collected over the years. 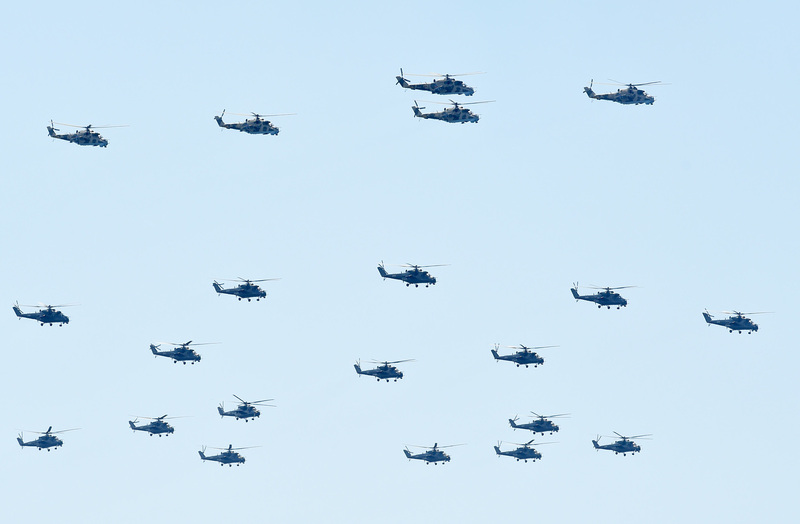 Seen in the photo above are 21 Hind gunships, a figure larger than current estimates of how many attack helicopters Azerbaijan has. If these Hinds were taken from their bases for ceremonial use, then perhaps others remained in hangars. This means Azerbaijan’s air force maintain twice as many operational Hinds as shown in the photo. That’s a lot! Turkey was supposed to have offered its T129 gunships as replacements for these but it looks like Azerbaijan is keeping its flying tanks for now. Having won another sham election in April this year, President Aliyev doesn’t hesitate to lavish weapons on his military. But to what end? The economy isn’t recovering from low oil prices and Armenia, despite its problems, is arms racing just as hard with its own meager resources. It’s not as if Azerbaijan can pretend it’s a “regional power.” Far from it. But strong? That will work.